In January 2007 Voice 1156 will present a series of images from Jack Alger, under the title " LA LUCHA SIGUE". Upon the photos, selected contributors will illustrate their interpretations. According to Alger, "I am really intent on putting my images out there to help bring some attention to what is happening in our neighbor country (OAXACA, Mexico) - to increase the awareness of what is going on. I never thought in a million years that I would get involved in anything political where government hit men are killing people around me to keep them silent but that is where I find myself today, in very strange territory. "A crowd of men and women of all ages occupy the plaza of Iglesia Santa Domingo and its surrounding streets. Everywhere one looks women can be seen knitting in the improvised shade and shelter of tarps. Patient lines form as volunteers bring food. Occasional rambunctious youths with masks and rocks prowl the edges under the watchful eyes of the pacifist movement. What began as a teachers’ strike has escalated and leveled-out into a stand-off between the federal police and the people of Oaxaca who are demanding the removal of the state governor, Ulises Ruiz Ortiz. "Beginning in May, thousands of teachers filled the streets and city center in an annual sit-in in demand of better wages and conditions, but on June 14th Governor Ruiz sent the police riot-force to disband the protestors and disallow further demonstrations. The assault scattered the protestors and killed four people, but when the people’s radio station spread the news, two hours later many thousands more people returned to the city center to drive out the police. 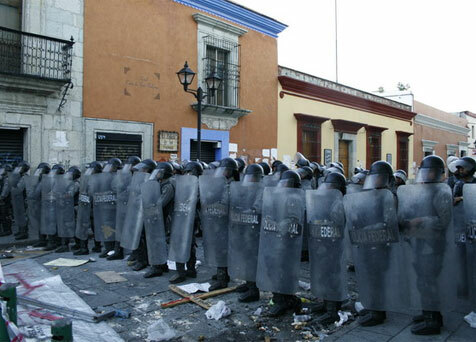 "The people took control of Oaxaca and the city did not descend into chaos and looting as might have been expected. The teachers’ union was joined by many other unions and indigenous groups, forming the Popular Assembly of the People of Oaxaca [APPO]. Neighborhood watches were quickly organized and an atmosphere of public vigilance reigned. "In August the teachers erected barricades to protect themselves in the city center and surrounding neighborhoods. There was less violence reported in the subsequent months than in the previous ten years, but many business owners were upset by the decline in tourism and the “stranglehold” that APPO held on the street traffic. Throughout August, September and October guerrilla attacks were launched against the barricades, and the drive-by shootings resulted in the deaths of more than a dozen teachers. "With the murder of the American journalist Brad Will on October 27– caught on video by himself as armed, local municipal leaders loyal to Ulises Ruiz shot and killed him -- president Vicente Fox responded to the impending influx of international media attention by sending 4500 federal police to regain control of the city of Oaxaca. "It was a test for APPO’s strict policy of non-violence, and as police filled the streets and formed lines of shields, Radio Universidad, the functioning voice of APPO, called constantly for people to fight only in defense of themselves, their fellows, and of the radio station itself, and to never use firearms. As the police formed heavily armored lines, backed by water canons, the people built up their barricades and set cars and busses ablaze in the streets, more a statement of resistance than an act of aggression. "The police drove the people out of the central square, the Zocalo, but being a movement without a center, they reconvened the next day, three blocks up from the line of police, unfazed, perhaps even reinvigorated and more determined than before. "APPO was finally provoked to violence by the police threat to take over the University Radio station which was legally used by APPO, who responded with calls for non-lethal harassment of the police lines, resulting in a six hour struggle and stalemate. "The police continue to hold the center of the city, yet they are surrounded by the protestors who numbered in the hundreds of thousands during a march staged one week after the initial police occupation. APPO remains determined and refuses to disband until Governor Ulises has been officially removed from office, the federal police have been removed from the city, the detained protestors have been released, and those responsible for killing the 17 teachers and Brad Will have been brought to justice. "Until then, the standoff continues, police stand at ease behind their shields while confronted by throngs of protestors who appeal to the officers to understand their motives.